We just had our first snowfall in Baltimore this weekend. With the colder weather comes an innate craving for warmer comfort foods, like this chicken tikka masala dish we had for dinner in our Instant Pot last night. Because I try to eat seasonally and pay attention to what my body is craving at different times of the year, I find myself eating fewer salads but more soups and fewer smoothies but more oatmeal. On days I do want a smoothie, I shy away from tropical flavors and other combinations better suited for summer and load up my smoothies with warming, grounding spices! That’s how the idea for this Chai Almond Butter Smoothie came to be. I’ve made other spiced smoothies like this Snickerdoodle one, this Turmeric Golden Milk one (two of the most popular recipes on my blog! ), and this newer Apple Cinnamon version. Today’s smoothie contains some similar spices, but it pays homage to one of my favorite drinks. Chai tea is made with a blend of spices, including cinnamon, clove, cardamom, ginger, and a hint of black pepper. All of these spices are highly anti-inflammatory, immune boosting, and digestive-supporting and some even have anti-viral properties. We tend to forget about spices when we are focusing on upgrading what we are eating or drinking, but, as you can see, they are powerhouses of nutrients! Today’s smoothie uses a blend of those spices and some almond butter for protein, fat and creaminess, all of which will keep you coming back for more! This fall-spiced smoothie is packed with anti-inflammatory compounds and tastes like a cup of chai tea! Combine all ingredients in a blender and blend until smooth, about 45-60 seconds. Add up to 1/4 cup more almond milk, if needed. Pour into a glass and enjoy! Since I’ve been feeling better, I’ve been back in the kitchen experimenting with recipes. My most recent hit was this vegan, gluten-free carrot cake muffin topped with creamy cashew icing. If you haven’t already tried it, you totally should! It’s been a while since I posted a new smoothie recipe, but since I was already tinkering with the ingredient profile for carrot cake, I thought I’d try coming up with a carrot cake smoothie. Some recipes come together easily, and after one or two attempts, it ends up tasting good. This smoothie took about six attempts before I came up with something that I really liked! I have to give a shout out to my friend, Kat Downs, who writes the awesome blog, Crunchy Kat, for being willing to be a recipe tester for me! She will be featured in my next blog post, so I’m really excited for you guys to meet her. In the meantime, give this tasty carrot cake smoothie recipe a try. You might be surprised to find that it contains a secret ingredient you won’t even taste that will give you an extra serving of vegetables. When I think of upgrading what I eat, this is one of the easiest ways to do it! If you like all the flavors of carrot cake as much as I do, you're going to love this creamy, dreamy smoothie! 1 piece frozen or fresh pineapple Trust me, this makes a difference! Add all ingredients through almond milk to the blender and blend until smooth. Add frozen fruit and blend until creamy. Seriously, it’s so good! It tastes like a decadent dessert, but you can have it for breakfast. 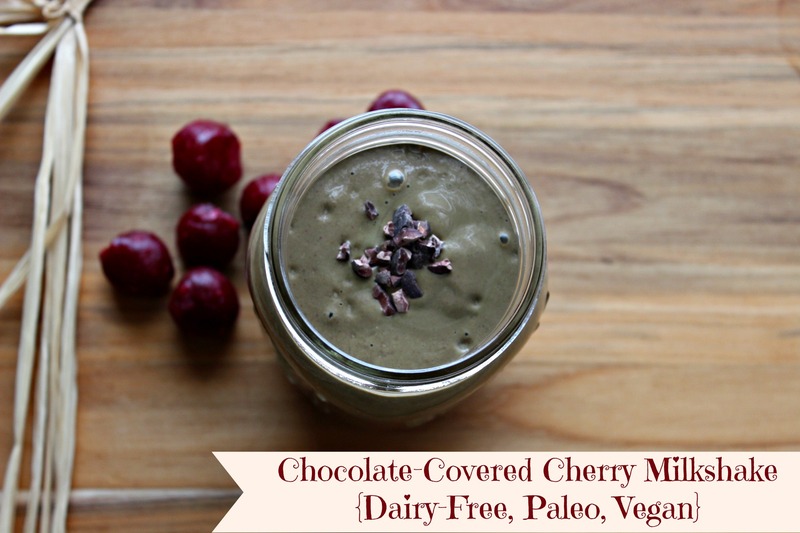 I was inspired to make this recipe after making a cherry chocolate pudding and thought I would try to make a drinkable version. 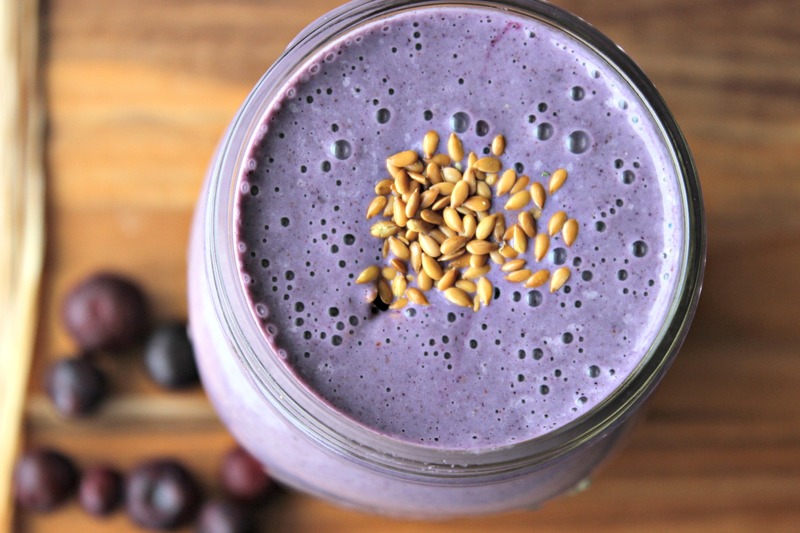 It’s one of the tastiest things I’ve made and is now Bill’s “go to” smoothie in the morning. What I like the most about smoothies (or, in this case, milkshakes!) is how easily you can pack lots of energy, immune and beauty-boosting nutrients into ONE glass. 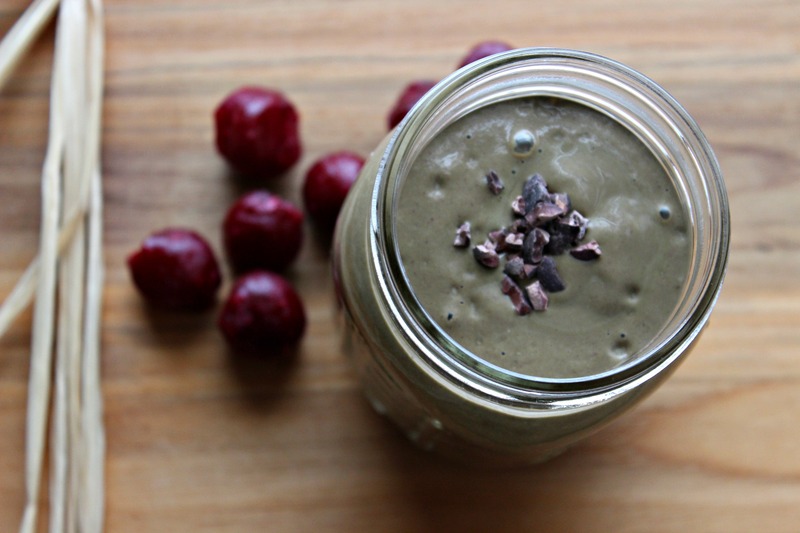 This one is loaded with anti-inflammatory and beautifying foods like hemp seeds, cacao powder, avocado and spinach. But cherries are the star. They’re a fruit that we’re all familiar with but don’t hear too much about healthwise. Check out all of the health-boosting benefits of cherries below. They’re full of compounds that help the body “cool down” inflammation, so they’re especially helpful for people suffering from arthritis, gout, and heart disease. Remember, inflammation is one of the KEY reasons we are sick and overweight. Not only is this smoothie shake fueling and nourishing, it’s also rich, creamy, chocolatey and silky smooth. You have to try it! Optional: sprinkle some cacao nibs on top for a chocolatey crunch! Put all ingredients in a blender in the order listed above and blend for about a minute or until smooth and creamy. Smoothies are a simple way to “upgrade” your diet, adding in lots of nutrients that keep our bodies clean, energized, and healthy. Since cutting dairy out of my diet, I miss creamy foods, so smoothies are an easy way for me to get that creamy texture I love. My hubby and I have them for breakfast most mornings. We change them up, so we are getting a variety of nutrients from different fruits, vegetables and super foods. 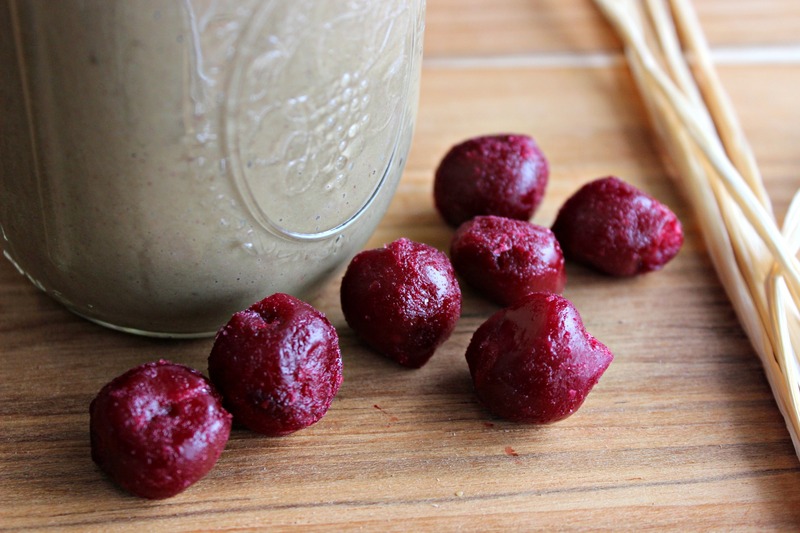 This smoothie has a lot going for it, including being anti-inflammatory and detoxifying AND being loaded with what Dr. Fuhrman refers to as the healthiest foods on the planet – GBOMBS. 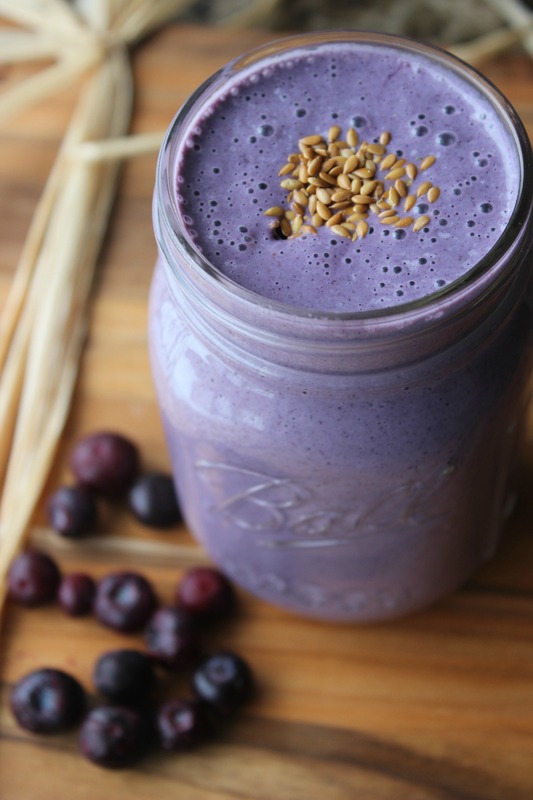 According to Dr. Mark Hyman and other functional medicine doctors and nutritionists, inflammation and toxicity are the two reasons most of us are sick and holding on to extra weight, so we want to load up on foods that help us reduce them, and this smoothie does the trick! Blueberries are one of the best foods you can eat. They are low in sugar and their high antioxidant power helps protect your heart and contains potent anti-cancer compounds. In fact, berries are considered one of Dr. Fuhrman’s GBOMBS foods – the most powerful anti-cancer, anti-fat storage foods you can eat. Avocado, hemp seeds, and flax seeds are excellent sources of anti-inflammatory omega-3 and monounsaturated fats that are not only good for our skin, hair and body but also for our brain (our brain is 60% fat!). 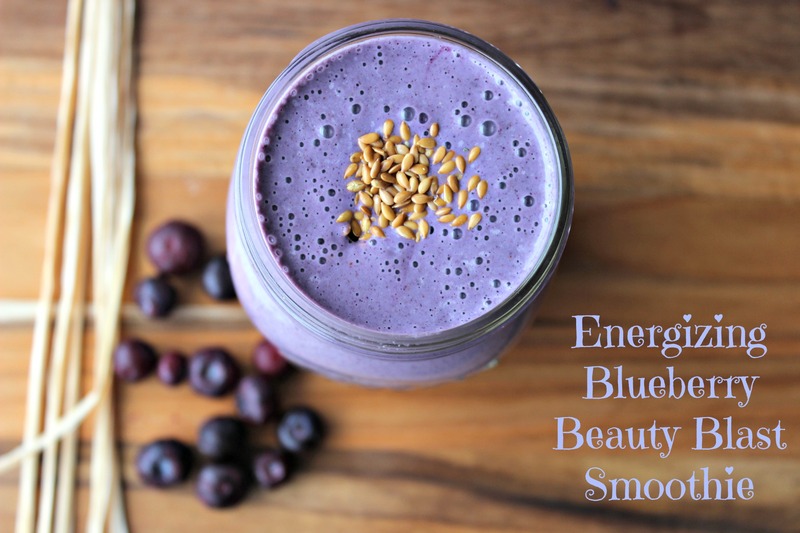 Flaxseed is also loaded with fiber, which helps regulate blood sugar (key to staying energized! ), keep us feeling fuller, and promote healthy digestion. Leafy greens like spinach are one of the most nutrient-dense, disease-fighting, health-promoting foods in the world. They are detoxifying, anti-inflammatory (“cool” the body), cancer-fighting, oxygenating, alkaline (reduce acidity in our body), and loaded with anti-aging antioxidants and nutrients. It’s important to rotate your greens, too. Check out this link for tips on how to do that. 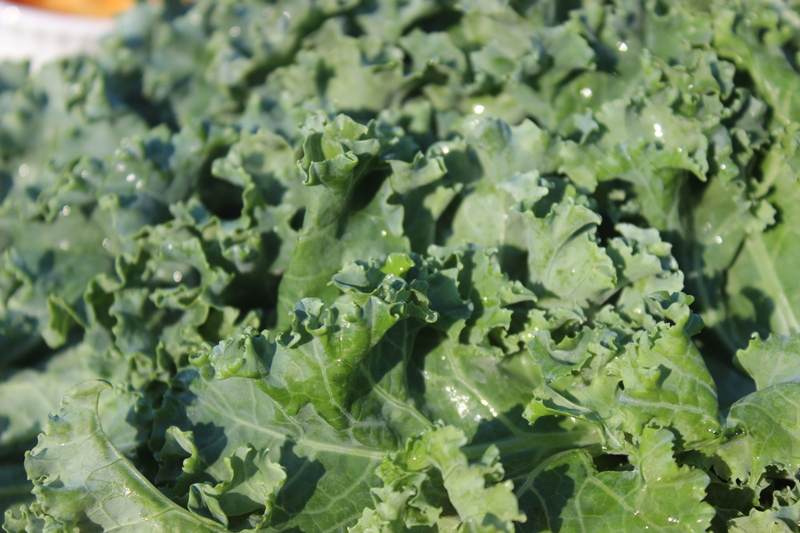 I like to rotate between kale (baby and regular), spinach, collard greens, Swiss chard and Romaine lettuce. Pineapple. The magic of pineapple is an enzyme called “bromelain” (say it, “BRO-ma-lane”). This enzyme breaks down proteins and foods and is a natural detoxifier (AKA body gunk cleaner outer). It also helps improve circulation and reduce mucus, which builds up in our digestive system, sinuses, and respiratory system. Clearing out mucus is important for overall health and beauty. Click here to learn more about pineapple. Put all ingredients in a blender in the order listed and blend until evenly combined, about 45-60 seconds. Add more almond milk, as needed. This smoothie takes me back to August 2011 when my hubby and I were relaxing poolside on our honeymoon in Jamaica. We tried all different kinds of mixed drinks while we were there and loved the island flavors. We also enjoyed fresh fruit every day, including papaya, pineapple and mango. The island was beautiful and definitely felt like paradise! 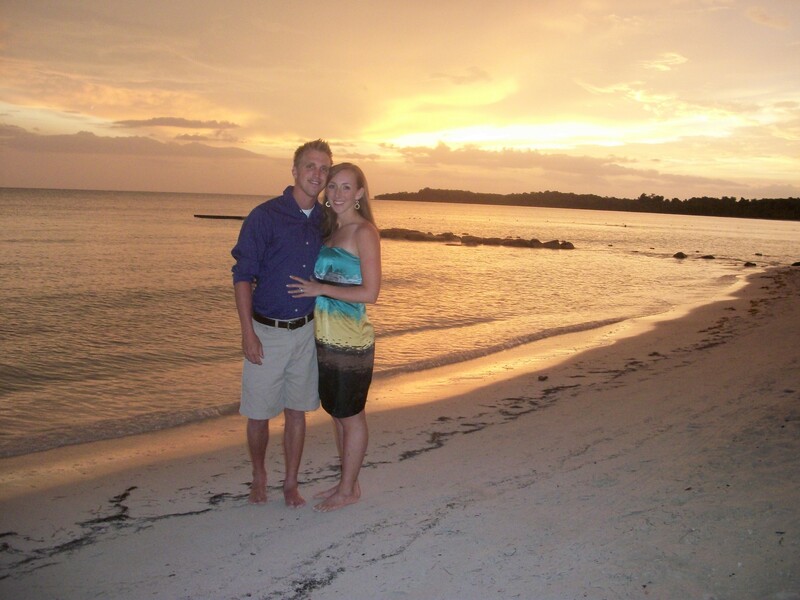 On the beach in Jamaica, mon! Fast forward almost three years, and Bill and I have found a way to bring some of those island flavors to our kitchen through our cooking AND smoothie making! We enjoy a smoothie just about every day for breakfast because it fills us up for hours and is a quick and easy way to get a concentrated source of anti-aging, disease fighting, energy-boosting nutrients into our diet. For all of those reasons, it’s also one of the ways I effortlessly regulate my weight. Click here to learn more about the health benefits of green smoothies. Think of coconut water as the new Gatorade…but healthier! Gatorade is loaded with chemicals, refined sugar and artificial colors and flavors that don’t nourish our bodies. Coconut water is a great natural source of electrolytes – minerals in our blood and body fluids that carry an electric charge, which affects the amount of water in our body, muscle function, and a variety of other processes. Harmless Harvest makes my favorite coconut water (which I just found out Safeway sells! Whole Foods, MOMs and Wegmans sell it, too). This site has a great post about the top 10 ways your body benefits from coconut water. To learn more about the best coconut water brands click here. A curly bunch of kale! Leafy greens are one of the most nutrient-dense, disease-fighting, health-promoting foods in the world, foods we should eat a lot of on a daily basis. They are detoxifying (clean us out! ), anti–inflammatory (cool the body), cancer–fighting, oxygenating, alkaline (reduce acidity in our body), and loaded with anti-aging antioxidants and nutrients. It’s important to rotate your greens, too. Variety is the spice of life 🙂 Check out this link for tips on how to do that. I like to rotate between kale (baby and regular), spinach, collard greens, Swiss chard and Romaine lettuce. The magic of pineapple is an enzyme called “bromelain” (say it, “BRO-ma-lane”). This enzyme breaks down proteins and foods and is a natural detoxifier (AKA body gunk cleaner outer). It also helps improve circulation and reduce mucus, which builds up in our digestive system, sinuses, and respiratory system. Clearing out mucus is important for overall health and beauty. Pineapple also contains manganese, which promotes skin healing and overall skin health. 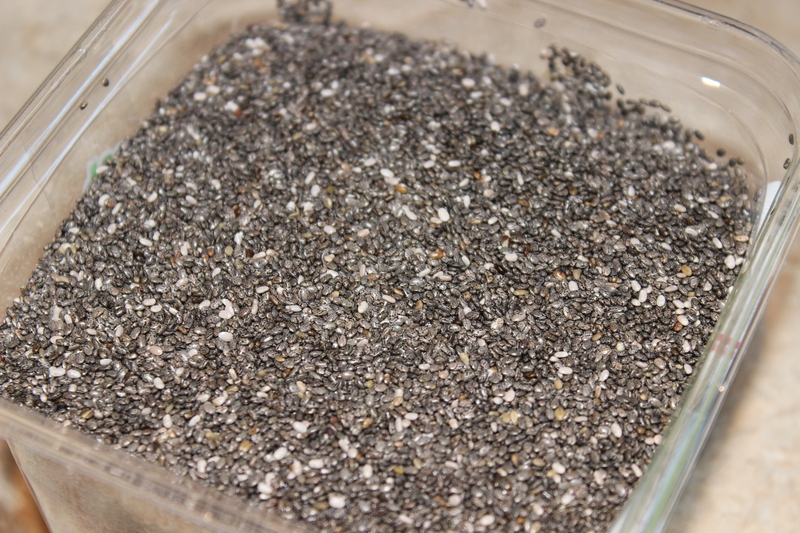 Ch-ch-ch-chia seeds! You can find these at any health food store, Wegmans, Trader Joes or online at Amazon, Vitacost or other stores. 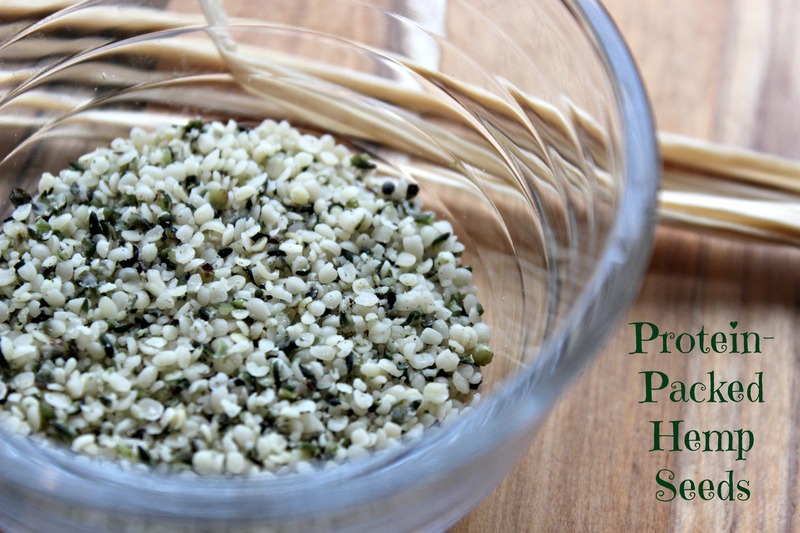 These teeny tiny seeds are a beauty detox and anti-inflammatory super food. They swell to 10-15 times their original size when combined with liquid and form a gel, which helps to keep us feeling full and hydrated for hours. Since they contain lots of fiber, they help balance our blood sugar and keep energy levels up. Their gel-like consistency promotes optimal digestion and keeps things moving in our digestive system (trust me, we want to keep things moving!). Lastly, they contain high levels of antioxidants, which help counteract the damage of things like stress, poor diet, smoking and other health stressors, and omega-3 fatty acids, which are important for balancing hormones and nerve functions. 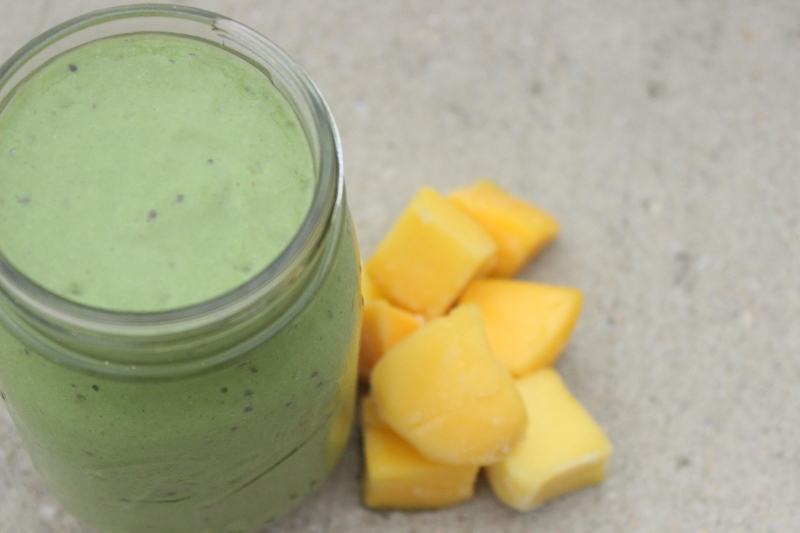 Bananas, shredded coconut, and mango are a few other ingredients in this smoothie that are loaded with health benefits, too, but let’s just get on with the recipe! To learn more about the health benefits of any one of those foods, check out this link for the World’s Healthiest Foods. Inspired by the tropical flavors from our honeymoon, this smoothie is packed with nourishment and will keep you full for hours! Put all ingredients in a blender, in the order listed above, and blend for 30-60 seconds until the smoothie is fully blended. How do you know when you’ve come up with a good recipe? When you find yourself scraping every last bit out of the blender and your glass with a spatula, so nothing goes to waste! That’s what happened the other day when I made this pumpkin pie smoothie. I originally made this recipe back in June but have since tweaked it. I’m up for enjoying pumpkin any time of the year because I LOVE pumpkin! 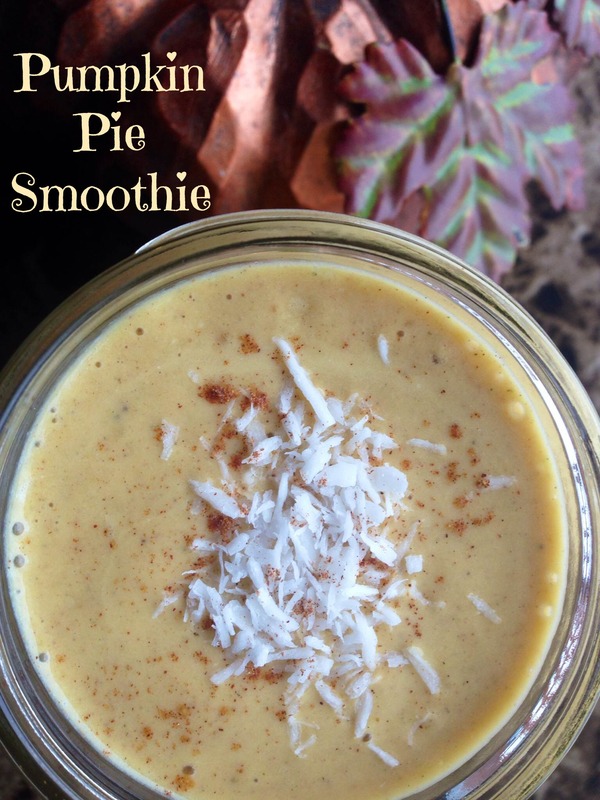 This smoothie/shake tastes more like a decadent pumpkin pie dessert than a breakfast or snack. I could literally drink this every day! If you don’t want to use the spices outlined below, just use 1/2 tablespoon pumpkin pie spice from a jar that already has everything blended. 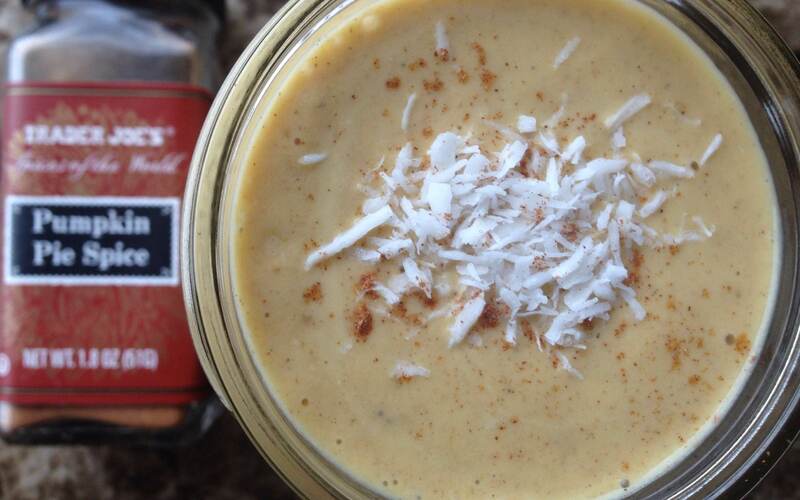 If you're in the mood for a seasonal smoothie full of fall spices, try this one! 1 frozen banana peel before you freeze it! Put all ingredients in a blender in the order listed above and blend for 30-60 seconds, adding optional ingredients if you want. Enjoy! Baby spinach has a very mild flavor. It will make your smoothie light green instead of orange but will also boost the nutrient content without affecting the flavor. You can buy organic, no-sugar pumpkin purée from a can at a health foods store or make it yourself following this process. Just make sure you are buying Pumpkin Puree and NOT canned pumpkin pie filling (they are different). If your dates aren’t soft, soak them in warm warm water for 20 minutes before blending, so they blend more easily.